I bought a HUGE Ham for Easter..mostly so I could have leftovers. I wanted to share 3 easy recipes you can make out of Ham. Last night I made Ham Noodle Casserole It is so easy and deelish! And Don’t Miss the 13 New Delicious Recipes for Leftover Ham for 2013! 1 cup or more if you like cheese, any kind of cheese..it’s all good! Preheat oven to 350 degrees, spray 9×13 pan with cooking spray, boil noodles. While noodles cook, mix together all other ingredients EXCEPT butter. Mix cooked noodles with mixture, pour into pan, pour melted butter over the top. You can add more cheese on top too if you want it cheesier. Cook for about 20 – 30 minutes. You can add any kind of veggies to this casserole if you want. In a large pan bring water, chicken broth, ham bone, split peas, carrots, onion and celery to a simmer. Add allspice and thyme. cover and simmer for one hour..stirring occasionally. Remove bone and cut off meat and put back into soup..don’t put that bone back in..discard it. 13 more Deeelish Recipes for Leftover Ham! I’m simmering some split pea soup on the stove right now! 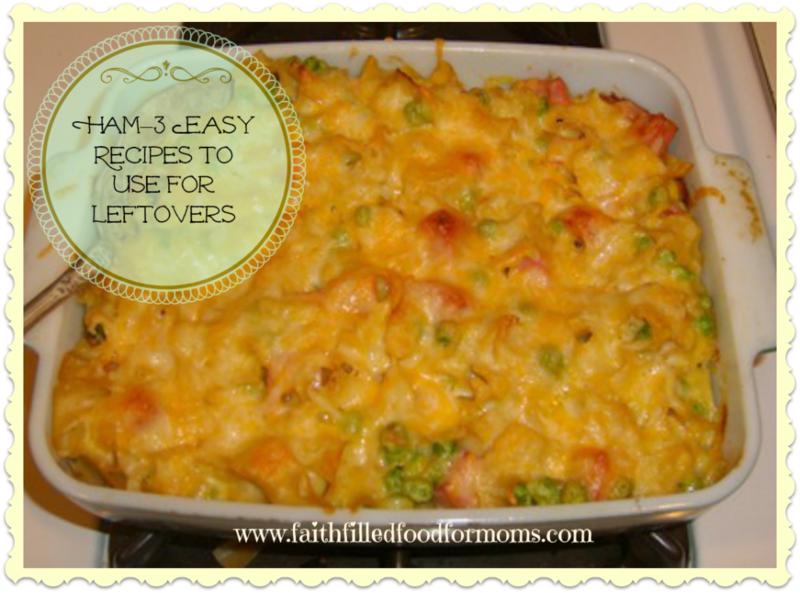 I know my kids will like that noodle casserole…they love any kind of pasta! I’ll have to make that one tomorrow! Great recipes! Split pea soup sounds great right now! They all sound delicious, but I particularly love the ham/noodle casserole. I made this last night for dinner and it was great. I threw in some frozen green beans that needed using up and added a dash of hot sauce to brighten the flavour. Also I browned a little onion with the ham before I mixed it all together. That’s awesome Abbi! I love it when my readers take a recipe and make it their own! Sounds deelish! I’m glad you liked it and thank you for stopping by to share! Blessings! !